Four frames from a strip I'm working on about the MMR vaccine controversy. This story will be as much about scepticism and the importance of critical thinking as much as it will be about the Wakefield debacle. Just trying to help: "discourse". I can't wait to see your comic version of this topic!!!! I love the vivid colours. 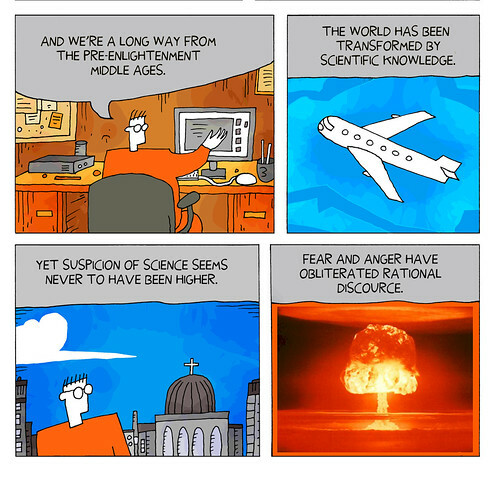 The enlightenment is much overrated. Have you ever read the book A Canticle for Liebowitz? It's a fairly good argument of the anti-science side of this topic. Also a fun science fiction book in general. And though the author takes the position that Catholocism, ie godfearingness is the only alternative to secular scientific progress I, as an atheist, still found it a generally decent argument. The scientists and politicians arrayed against the priests weren't objectionable strawmen at least.